Alfred W. McCoy. Beer of Broadway Fame: The Piel Family and Their Brooklyn Brewery. SUNY Press, 2016. Explores the hundred-year history of Piel Bros., one of the prominent German American brands that once made New York City the brewing capital of America. For more than a century, New York City was the brewing capital of America, with more breweries producing more beer than any other city, including Milwaukee and St. Louis. 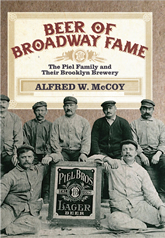 In Beer of Broadway Fame, Alfred W. McCoy traces the hundred-year history of the prominent Brooklyn brewery Piel Bros., and provides an intimate portrait of the company’s German American family. Through quality and innovation, Piel Bros. grew from Brooklyn’s smallest brewery in 1884, producing only 850 kegs, into the sixteenth-largest brewery in America, brewing over a million barrels by 1952. Through a narrative spanning three generations, McCoy examines the demoralizing impact of pervasive US state surveillance during World War I and the Cold War, as well as the forced assimilation that virtually erased German American identity from public life after World War I. McCoy traces Piel Bros.’s changing fortunes from its early struggle to survive in New York’s Gilded Age beer market, the travails of Prohibition with police raids and gangster death threats, to the crushing competition from the big national brands after World War II. Through a fusion of corporate records with intimate personal correspondence, McCoy reveals the social forces that changed a great city, the US brewing industry, and the country’s economy.